This amazing yurt is perfect for nomads on the go the Quite Cabin would be a wonderful way to have a nomadic home. This mini house is an alternative to the traditional yurt, and it might just become a favorite product when it comes to small spaces and cottages The best part is, all you will need is just a simple screwdriver and you have a unique tiny house to stay in short term. The Quick Cabins are fabricated by a company called Quite Lite. The cabins consist of prefabricated panels that make the structure simple and easy to construct and can be built in a very short period of time. 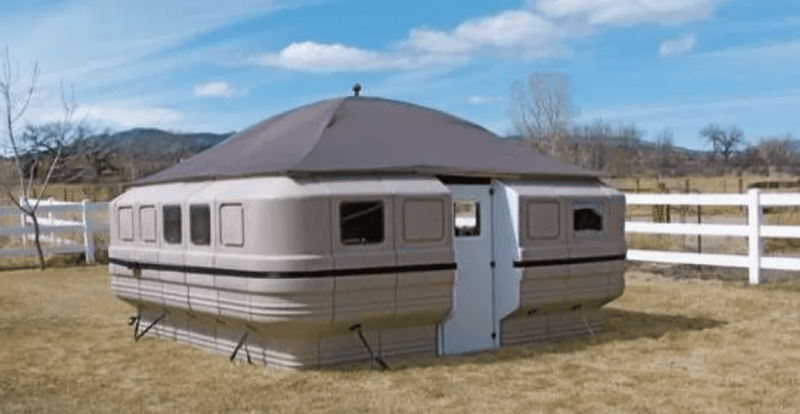 Each panel costs about $200, and you can design your own tiny house, so the cost of this yurt depends on how large you want to build your tiny house design. The nice thing about these panel houses is that there is always the option to build onto your tiny house if need be in the future by adding more panels. They are also great because of the affordability and the flexibility these panels offer. Its like modular housing and tenting united. These tiny house yurt style structures are also able to be taken camping. They can be disassembled and carried to the camping location to be assembled in about an hour or so. You can add in a nice thick air mattress and some comfortable linens and you will feel right at home. This type of unit could also be great for temporary housing while building another house, you may not want to stay in it in colder weather though, but it should be fine for temperate climates. The panels are molded from polyethylene, which is highly resistant to puncturing and it’s also UV resistant. It’s strong but also flexible which allows the panels to fit together easily and stay together to create a strong structure. The panels are also filled with foam to add strength and some insulation. When assembled, the panels are connected at the top, at the middle, and at the bottom using interlocking tabs and screws to secure them even more. There is also a water tight edge gasket which creates a seal between the panels. There are also sturdy tie down rings on the inside and outside and inserts on the interior walls to install furniture. They are also really easy to dismantle too which makes the structures easy to transport or store when not in use. The dimensions of each panel is 60 inches by 21 inches by 2-3 inches and they each weigh about 21 pounds. The door frame is made out of aluminum tubing and supports a lightweight door. The windows are a shatter proof acrylic and some of them also open and have screens in them. The roof is made from aluminum as well and it’s covered in heavy duty vinyl on the exterior with an insulation layer and an inner membrane. The exterior cover attaches to the hooks on the outside of the cabin with strong cords to prevent it from flying off. For venting and air circulation there is a 14 inch RV ceiling vent, included in the shelter kit which can be installed from the inside after the roof is assembled. There are two options to choose from when ordering one of these cool cabins, first is the Quick Cabin which is a 10 foot by 10 foot model that comes with everything you need to build the cabin. If you ever find you need more space, there are extension kits that can be added to the Quick Cabin too.